To ride a motorcycle, we have to forgo a few things. Weather protection. Crash protection. The ability to eat a burger with two hands while steering with your knees. In it’s place is the awesome sensation that is the reason we do ride. That real feeling of the ground passing inches below your feet and the way you feel at one with the machine as you lean into a corner. Today’s feature bike is owned by one such person, who has forgone luxury in order to be able to enjoy the sweet feeling of throttle roll. 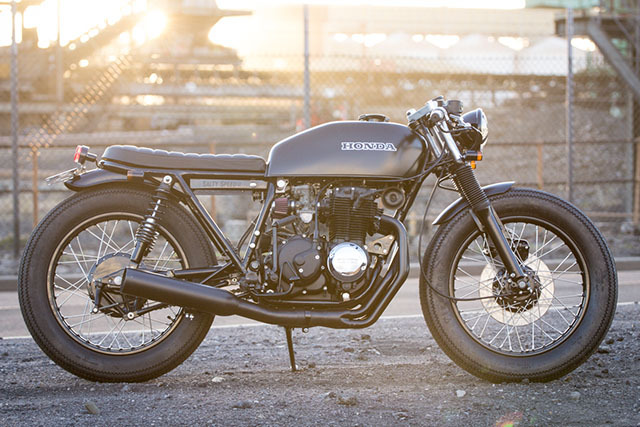 Micah, the owner of this 1975 Honda CB400F decided that even with unconstrained access to his Dad’s luxury rental car business, a motorcycle is the way to travel in Melbourne. While scouring the net, Micah happened upon Salty Speed Co’s #002 build on Pipeburn and fell in love. It had to be their workshop who modified his bike. And so it began. 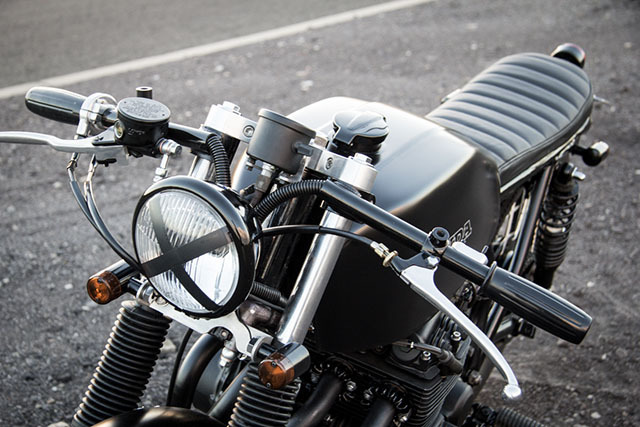 A few weeks after deciding on the Wollongong bike builders, Micah purchased a “not so good looking” CB400F sight unseen. 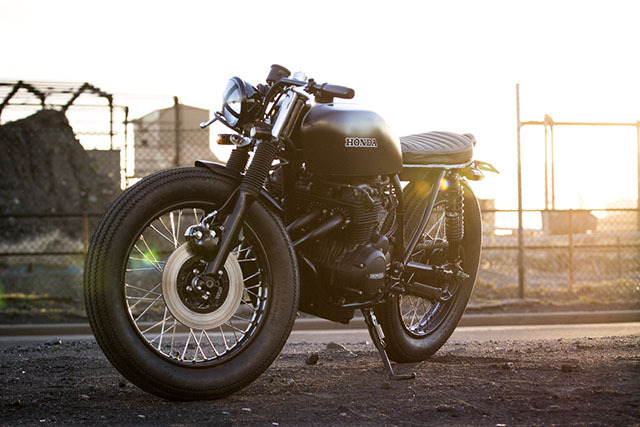 The machine was delivered to the Salty Speed Co’s workshop with one alliterative build brief: Build a black brat bike. The CB was stripped back to bare frame, detabbed and the factory seat hoop ditched. In it’s place sits a kicked rear hoop and battery, both fashioned inhouse at the SSP workshop. The original 1975 fender was cropped and remounted accordingly, while at the front end sits a Shorty aluminium fender from WM Japan. 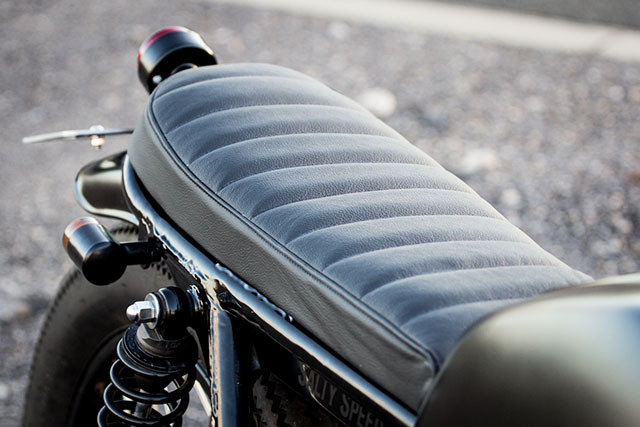 With the need for a new seat to suit the custom hoop, the SSP crew produced a neoprene cushion wrapped in leather. This was mounted on a steel seat pan, and mounted to the chassis using bracketry of their own making. To ensure brat styling, Firestone Deluxe 4.00 tires have been utilised on the build. These tires have been mounted on powder coated stock rims, laced with stainless steel spokes. All brakes are running new componentry, with the front calliper being rebuilt, and a new Nissin master cylinder being fitted. The factory forks being deemed up to the task, they were rebuilt and the lower section powdercoated. The main modification to the front forks is the fitment of a Dime City Cycles triple tree, and a tapered bearing conversion for the steering head. 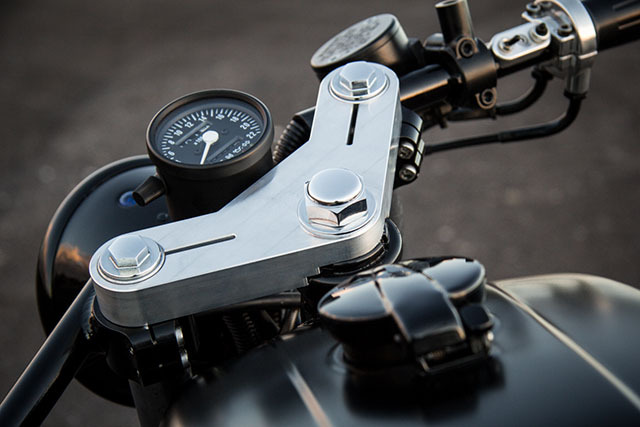 A set of aluminium clip on bars round out the brat styling on the front end, along with a DCC speedo to replace the clutter that was the original dash cluster. With bikes of the 70s having a reputation for electrical issues, the factory wiring loom has been surgically removed from the midsize Honda. A brand new Sparck Moto harness has been wired up, sleeved in black braid wrap. Sitting under the new hoop setup is a Rick’s Electrics rectifier combo, with the juice provided by an 8 Cell Anti gravity battery. The ignition switch has been relocated, the starter button mounted on the battery box and switch controls being Posh brand. The engine internals have been left stock for the build, the major performance mod being the fitment of a custom exhaust, and re-jetting of the carbs to suit the pod filter system. 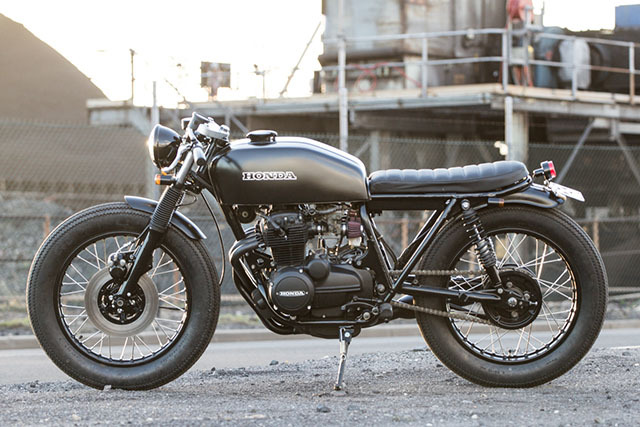 From beaten up CB400F to ‘murdered out’ street machine, Micah’s bike has had the full Salty Speed Co’s treatment. Just the thing for cutting up the laneways of Melbourne. With a full garage of luxury cages at his disposal, we think Micah made the right decision swapping four wheels for two.